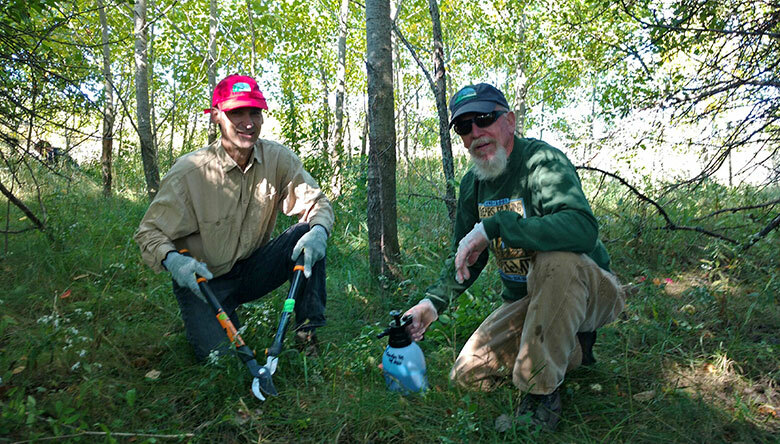 We are pleased to announce the completion of the first round of invasive shrub removal in the Bay Shore Blufflands Buckthorn Blast! The project is a community conservation effort designed to enhance the nature preserve and encourage the neighborhood and greater community to participate in the effort. Jason Wilke, of Nature Care Ecological Consulting and Services, worked at a quick pace to wrap up control efforts on 214 acres before the sap began to rise this past week. This means that all but 1/10 th of an acre were treated and the cycle of summer maintenance by volunteers will begin. Jason says, “ We look forward to completing the rest of the project starting back up next December.” The project will continue over the next two years, with efforts to catch any new sprouts from roots or seeds before they become an issue. Why is Buckthorn such a thorn in our side? Buckthorn is an invasive plant that crowds out native species like trillium and lady’s slipper. Its shallow roots and heavy shaded canopy create erosion problems. And, its low branch structure means that shrub-nesting birds and their young become easy prey. Removing this invasive from the Niagara escarpment in the Bay Shore neighborhood is key for protecting federally endangered Ram’s head orchid and the wildlife habitat on which birds rely.